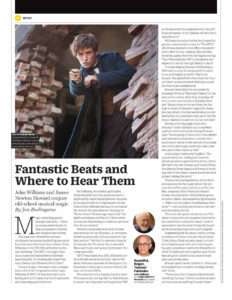 The first of my four stories in a special edition of this week’s Variety deals with fantasy-film scores, specifically The BFG by John Williams and Fantastic Beasts and Where to Find Them by James Newton Howard. Both composers gave me time on the phone last month, Williams before he dove back into the Star Wars universe — he begins recording in a matter of weeks — and Howard prior to leaving for an extended stay in Europe. These are two of the finest orchestral scores of the year and, in this story, we delve into the details and the approaches to two very different fantasy tales (one by Roald Dahl, whom Williams knew, and one by J.K. Rowling herself). This entry was posted in Composers, Film Music, Interviews and tagged Fantastic Beasts and Where to Find Them, James Newton Howard, John Williams, Star Wars Episode VIII, The BFG, Variety on December 2, 2016 by Jon Burlingame.